Ugh. We’re more than 3/4 through the year and it’s time to revisit those goals I set back in January. In typical Katy fashion, I set them too high. Today I’m taking a look back at what I have done and how I can continue progressing for the next 3ish months. This time around I’m taking things month-by-month, being a bit more specific and not overwhelming myself with trying to take on too much at once. So far, it’s been helpful to see what I’m trying to accomplish each month because it’s easier to see what is actually feasible. Where I’m At: After reading Gretchen Rubin’s “The Happiness Project,” I decided this was something I could relate to. In general, I had hoped to take smaller steps to get to what I’m trying to accomplish because it’s less overwhelming. I’ve been better about starting a draft blog post or jotting down notes when I think of ideas – but I haven’t been making them into finished posts. New Goal: Good news – I have lots of half-written posts done. Now it’s time to finish and publish these. 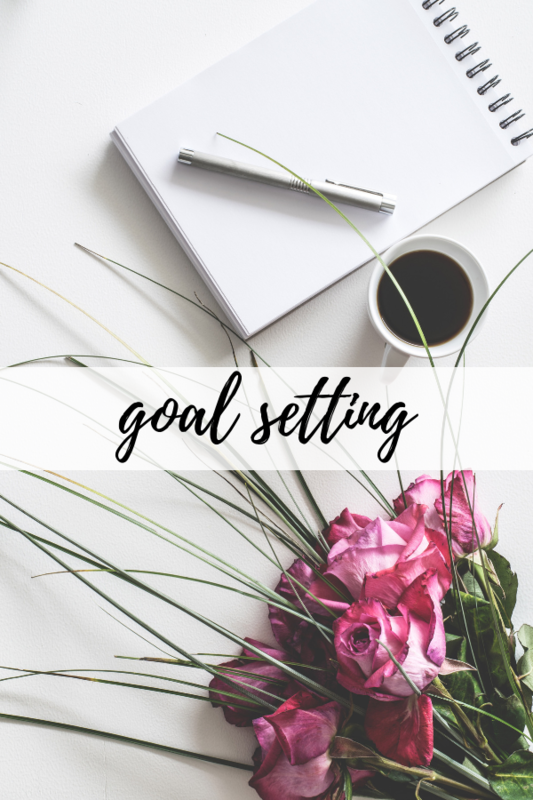 And as I mentioned above, my overall approach to goal-setting is going to be about making progress throughout each month without overwhelming myself. Where I’m At: I was off to a decent start this spring, with six blog posts in February and seven in April… but then I lost my groove. I have so many ideas but got busy with freelance writing work (yay!) and the craziness of summer. I also want to be better about promoting content I do write via social. My goal of 100 blog posts in 2018 is LOL at this point… I have 23 down so far. New Goal: Aiming for 2-3 posts/week from now through the end of the year, which will bring in 26-39 more posts. Even on the low end, I’ll at least close out the year with 50 posts, 50% of my original goal. And on the note above, I want to take the time to promote my posts, particularly via Pinterest using Tailwind, which I hope to have all figured out within the next few months. I also have a big goal of going through a blog redesign before the New Year, but admittedly I need to do more research to understand how big of a project this really is. Where I’m At: Ok… so I’ve only published one travel post so far this year on Daily Katy. BUT in April, I took on a freelance travel writing gig with TripSavvy.com, which is something I had been looking to do for a long time. Admittedly, it’s taken away from my regular blog content, but the reality is that it is a paying, steady job that I needed to get in a groove with before I could spend more energy on the blog. New Goal: I still have lots of travel content to finish up and publish, including new recommendations from recent trips to Palm Springs, Savannah and soon Grand Cayman! Aiming to publish one travel guide a month for October, November and December. I’m also playing around with a new travel-specific Instagram, @katyctravels, so follow me there! Where I’m At: I still have BIG aspirations when it comes to learning new skills. I have this urge to figure everything out for myself, but just don’t have time to do it all – or at least do it all well. I got a new iPad and the fancy pencil thing that goes with it but have yet to try out the Procreate app that I’ve been dying to learn. I also haven’t taken any photography or editing classes either, but I almost had my first gig shooting headshots, which unfortunately fell through due to scheduling. New Goal: Not going to set this one too high. I’d like to play around with Procreate to teach myself digital calligraphy when the weather gets cooler, which seems like a good Sunday football activity. Next year I can get back into photography. Where I’m At: Zero progress here. I’ve made a few sales on existing items in my shop here and there, but really haven’t spent much time building out my shop. I did create a few invitations and favors for a friends’ baby showers and as gifts, but haven’t yet posted them. New Goal: Post what I’ve made! I don’t know why this always seems like such a daunting task. And after that, I plan to add a few new types of items to my shop – potentially a 2019 calendar and to do list notepads I’ve been playing around with. I also plan to listen to a few podcasts about how to best promote the products I do have in my shop, especially heading into the holiday season. Where I’m At: This one was off to a slow start – but I blame my new-found love for podcasts. I was late to the game, but they are perfect for my short commute! Read about some of my favorite episodes/podcasts here. I had set a goal of reading 12 books this year – I’m at at least 8, so actually relatively on track. Definitely not one a month, but two YA trilogies helped me zoom through 6 books! New Goal: Back to one book a month starting in November. It’ll be an extra bonus if I can get a third in during October or December, but right now it feels like I have a lot on my plate to start. I do want to publish at least one more book review blog post, which I already have in the works. Where I’m At: I’ve been OK at this here and there and am gearing up to do a big Goodwill donation as I change over my summer to fall clothes. New Goal: Keep working on this – it’s certainly not one of my strengths but I know it does make me feel good when I have fewer things to sift through when I get ready in the morning. Where I’m At: SUCCESS! This year, I’ve successfully revamped my bathroom (see the full transformation and shop everything here) and our condo’s entryway (coming soon!). After being in our condo for over 6 years, it was time for a little bit of a refresh. The goal was/is to not break the bank because eventually we’ll move to a house outside the city. New Goal: Next projects will probably be finding a good rug and coffee table for our living room, but this may not happen this year. I’ll be on the lookout – maybe something will catch my eye during holiday sale season. Where I’m At: The 5-year daily journal and gratitude journals were a fail. Turns out that I’m not good at remembering to do things like this and then it feels incomplete and I stop all together. I did try out the Headspace app a few times. New Goal: I think this will be a never-ending goal, as we could all use a little more of this in our lives. I would like to keep trying the Headspace app more consistently. And I also want to take time to do things like read a book, get my nails done, etc. – sans iPhone. I’m also trying not to mindlessly scroll quite as much. Where I’m At: I think I’ve gotten a little better at doing things like writing my to do list the night before, but still have lots of work to do in this department. New Goal: Refocus on small things – picking out an outfit for the following day before bed, not letting dirty laundry pile up beside my bed, responding to emails that only require a couple minutes of my time instead of letting them sit.